The Rebels overturned a 14-point second-half deficit to beat the Brumbies 27-24 on Saturday, writes SIMON BORCHARDT. The result ends the Rebels’ five-match losing streak and takes them to within one point of the Waratahs at the top of the Australian conference (the Tahs do, however, have a game in hand). For most of this contest, it looked as if the Brumbies would end a three-match losing streak and keep their slim quarter-final hopes alive. They led 24-10 at the end of the third quarter, before the Rebels turned the game on its head with tries from Jack Maddocks and Semisi Tupou. Reece Hodge kicked both conversions to level the scores at 24-24 after 66 minutes. Rebels replacement Matt Phillip was then harshly penalised for not releasing the ball, despite the fact that he hadn’t been held on the ground after being tackled, but justice was served when Christian Lealiifano’s penalty went wide. With three minutes remaining, Sam Carter was penalised for a high tackle on Billy Meakes, and Hodge held his nerve to nail the match-winning kick. The Rebels had started the game well. Angus Cottrell ran back to collect a kick, carried the ball down the left side of the field while beating two defenders and found Tom English, who sprinted 35 metres to score in the corner. But the Brumbies hit back after some good work by the forwards created an overlap for Tom Cusack to score. Wharenui Hawera slotted the touchline conversion. The Rebels suffered a further setback when Amanaki Mafi was yellow-carded for a high tackle on Scott Sio, who didn’t return to the field after his head injury assessment. The Brumbies took full advantage of playing against 14 men, with Faalelei Stone and Rob Valentini scoring converted tries to make it 21-5 after 31 minutes. The Rebels had to score next to stay in the game, and they did, just before half-time. A long pass from Jack Debreczni found Marika Koroibete, whose pop pass in the tackle put English away for his second. Debreczni again missed the conversion. The Brumbies dominated the third quarter and extended their lead to 14 points with a penalty goal from Hawera. 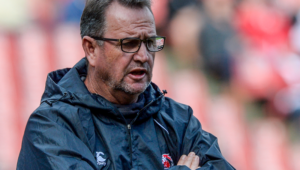 The flyhalf was then off-target with another attempt a few minutes later, and the Rebels responded with two quick-fire tries. Hodge, who had taken over the kicking duties from the wayward Debreczni, did the rest. 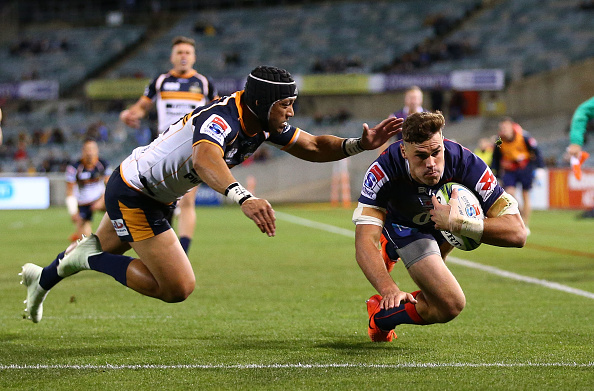 Brumbies – Tries: Tom Cusack, Faalelei Stone, Rob Valentini. Conversions: Wharenui Hawera (3). Penalty: Hawera. Rebels – Tries: Tom English (2), Jack Maddocks, Semisi Tupou. Conversions: Reece Hodge (2). Penalty: Hodge. Brumbies – 15 Tom Banks, 14 Henry Speight, 13 Tevita Kuridrani, 12 Christian Lealiifano (co-c), 11 Andrew Muirhead, 10 Wharenui Hawera, 9 Joe Powell, 8 Rob Valentini, 7 Tom Cusack, 6 Lachlan McCaffrey, 5 Sam Carter (co-c), 4 Rory Arnold, 3 Allan Alaalatoa, 2 Folau Fainga’a, 1 Scott Sio. Subs: 16 Robbie Abel, 17 Faalelei Stone, 18 Ben Alexander, 19 Blake Enever, 20 Lolo Fakaosilea, 21 Matt Lucas, 22 Jordan Jackson-Hope, 23 Lausii Taliauli. Rebels – 15 Jack Maddocks, 14 Semisi Tupou, 13 Tom English, 12 Reece Hodge, 11 Marika Koroibete, 10 Jack Debreczni, 9 Michael Ruru, 8 Amanaki Mafi, 7 Colby Fainga’a, 6 Angus Cottrell, 5 Adam Coleman, 4 Geoff Parling, 3 Sam Talakai, 2 Anaru Rangi, 1 Fereti Sa’aga. Subs: 16 Nathan Charles, 17 Tetera Faulkner, 18 Jermaine Ainsley, 19 Matt Phillip, 20 Sam Jeffries, 21 Lopeti Timani, 22 Harrison Goddard, 23 Billy Meakes.